Welcome to COASTE Magazine and Multi-Media Network. COASTE brings the best of Southwest Florida’s coastal lifestyle to more than 150,000 readers each issue — visitors and residents — via our integrated print magazine, digital magazine, e-mail marketing, social media, video and news-based website. Best of all, it’s all FREE. Subscribe free and follow COASTE for the newest and best in travel, tourism, attractions, events, lodging, dining, entertainment, arts, health, beauty, fitness, business and news for Fort Myers, Sanibel, Captiva, Fort Myers Beach, Cape Coral, Bonita Springs, Boca Grande and Lee County. Buzzworthy: Turning Broken Lives Around. Happenings: Sunday Yumday, Taste of the Islands. 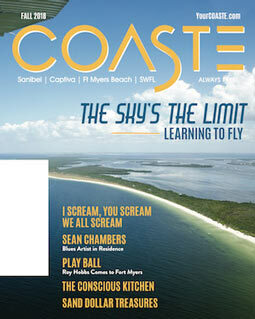 COASTE is Four Years Old: And We Have a Captiva Vacation Gift for You.